Axel Hütte was a student of Bernd and Hilla Becher (dusseldorf) who were highly influential figures in shaping deadpan photography. The deadpan aesthetic is known as a ‘germanic’ new objectivity with an encyclopedic approach to typologies (nature, industry, architecture, and human society). 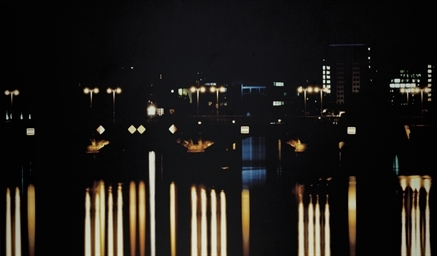 Hütte introduced a new element to deadpan by taking long exposure night photos of cities. He would then present the photos as transparencies framed in front of reflective surfaces which illuminated the photos and made the image seem to “emanate from the city.” He is known as a “landscape painter” because of his night shooting. This entry was posted in Uncategorized and tagged Axel Hutte by brittherring. Bookmark the permalink.